"This particular recipe has brought me success both in personal and professional cooking. The recipe is written for a 10-pound loin, but, can be modified by size. It gives the prime rib a nice crust exploding with flavor, and an interior so tender, it'll (hopefully) leave you wanting more." Preheat oven to 350 degrees F (175 degrees C). Trim any thick pieces of dense, hard fat from the roast, but leave smaller areas of fat in place. In a bowl, mix 2 cups of beef base with minced garlic, and rub the mixture generously all over the roast. Sprinkle the roast with 1/2 cup of fresh thyme, 1/2 cup of oregano, the black peppercorns, and salt. Place into a roasting pan. Roast in the preheated oven until the meat has formed a brown crust and a quick-read meat thermometer inserted into the thickest part of the roast measures 135 degrees F (57 degrees C), for medium-rare, about 3 hours. If you prefer the meat well-done, roast an additional 45 minutes. Remove roast from oven, and allow to stand while you make the sauce. Temperature of the meat will rise about 10 more degrees as it rests. Pour the water into a saucepan, and dissolve 1 tablespoon of beef base in the water. Mix in the red wine, and stir in 1 teaspoon of thyme, 1 teaspoon of oregano, and the garlic powder. Add the celery, onion, and carrot pieces to the sauce. Bring the mixture to a boil, and cook, stirring often, until the sauce reduces by half, 20 to 30 minutes. Strain sauce and discard vegetables before serving sauce with the roast. 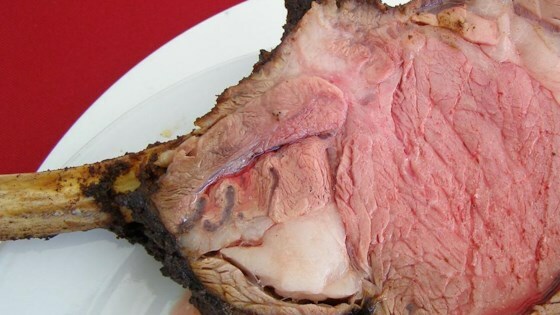 The prime rib loin is sometimes called a rib roast (first cut), a prime rib (loin end) or prime rib (small end). The tender meat comes from the back of the rib area of the animal. Made this for Christmas. My son said it was amazing! Everyone loved it. Soooo..... Good. This will now be our family tradition for Christmas. This was the BEST prime rib that I have ever had. Making it again for Christmas! This recipe was awesome and will now be our go to for Christmas dinner!! The only thing I did was cut the beef base in half.